This is latest version of our Model 7 which has 5 arms and 4 steel willowleaf blades. This Model also has upgradedwire. The wire is .051 Premium stainless steel which is more rigid than our standard .051 stainless steel. The Premium wire will hold the frame much better allowing for less adjustment between cast. 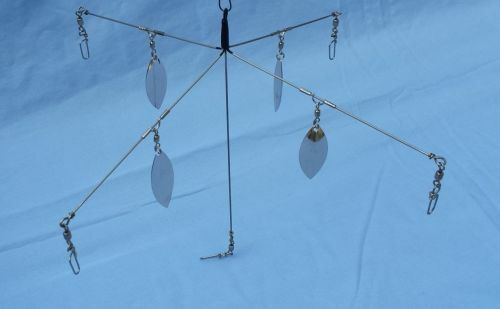 Standard on this Model is 5 leads with 1 lead of 7” and the other 4 are 5.25” long. 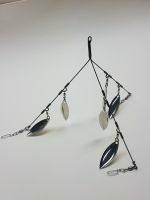 The shorter leads have size 3.5 (1.5") nickel steel willowleafs attached to them.